The crunch factor; a craving that can only be satisfied by consuming crunchy food items. Food items can be of either the sweet or salty persuasion. The crunch factor often occurs; while working on the computer for a prolonged amount of time, watching the tv or movies, playing video games, or around 4 pm (aka snack time). Ah, yes, the crunch factor. I’m always looking for ways to keep it healthy and still satisfy the CF. 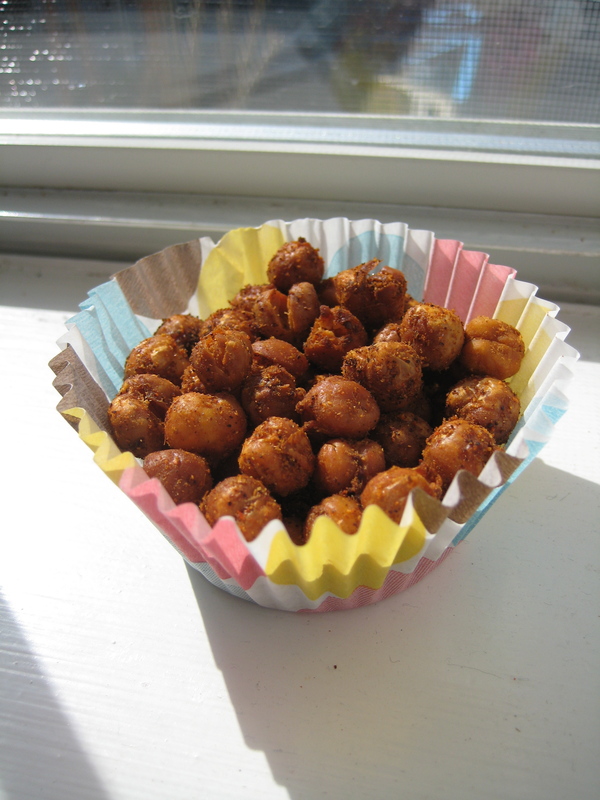 While I’ve tried out a variety of crunchy snacks, roasted chickpeas is my new favorite way to satisfy my crunchy cravings. *Ok, fine I’m not a nutritionist, but I swear these crunchy beans are better than Doritos and Cheese-its. 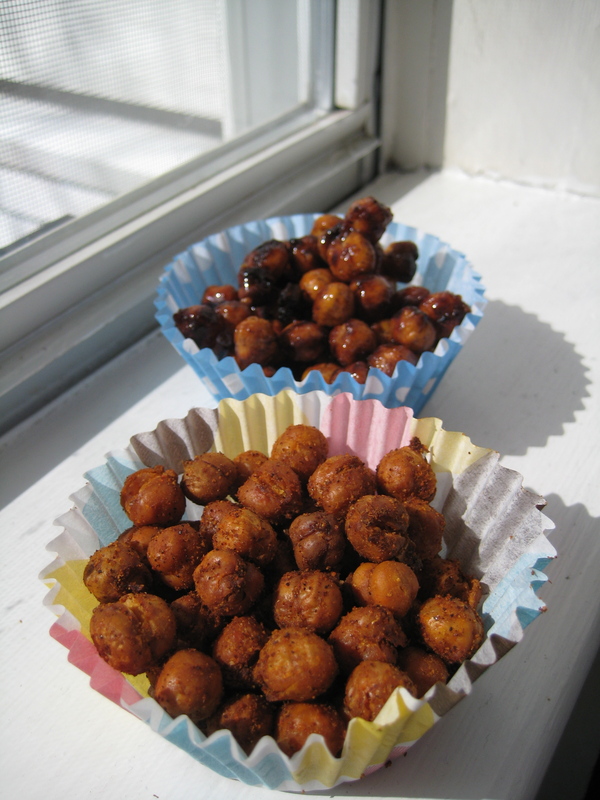 So here it is, roasted chickpeas two ways; spicy and sweet. 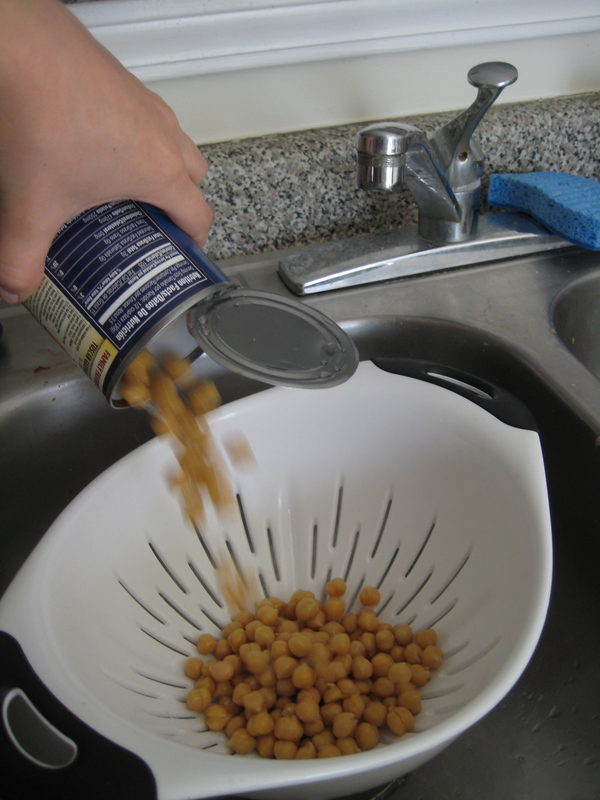 First drain the chickpeas in a strainer. Wash with cool water to rinse the starch off. 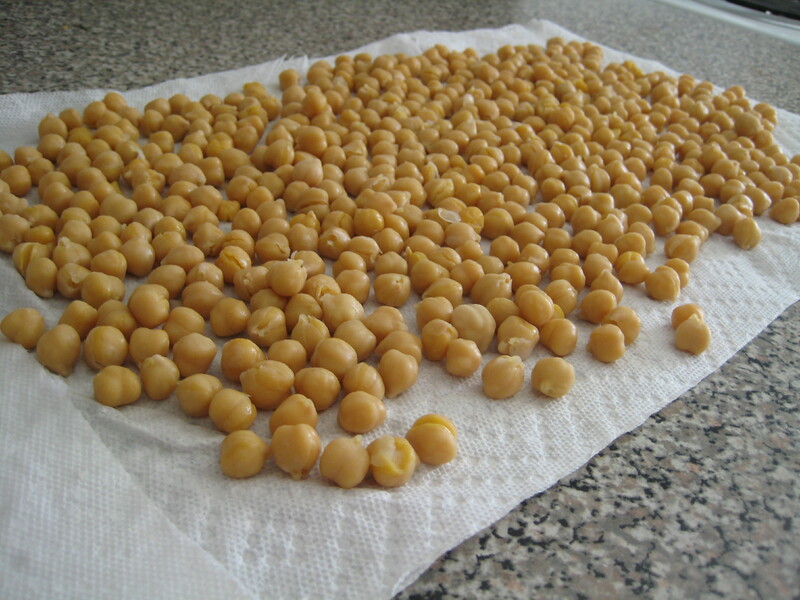 Next pour the beans onto a clean kitchen towel or paper towels to air dry. 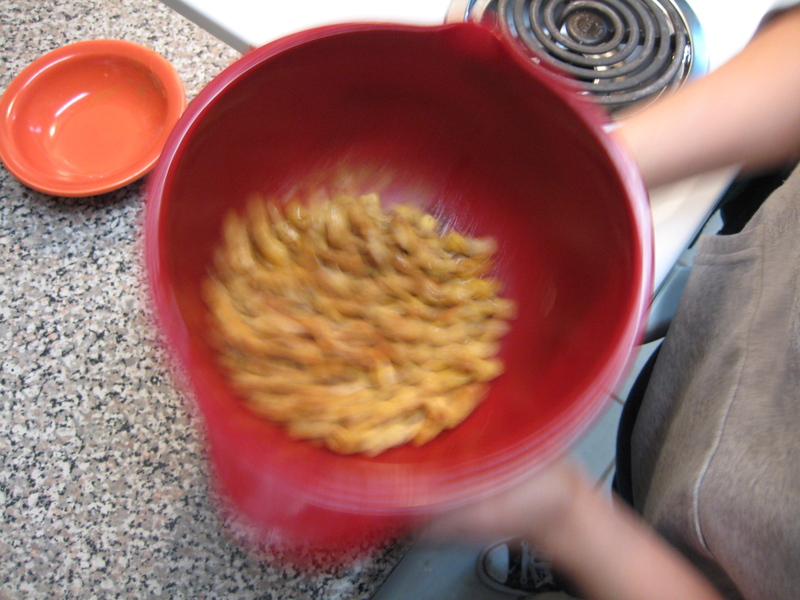 The key to these becoming a crunchy snack inside-out is allowing them enough time to thoroughly dry. I recommend allowing them to air dry for at least 1 1/2 hours-2 hours. After allowing the peas to dry, preheat the oven to 400 degrees and line a baking sheet with aluminum foil. 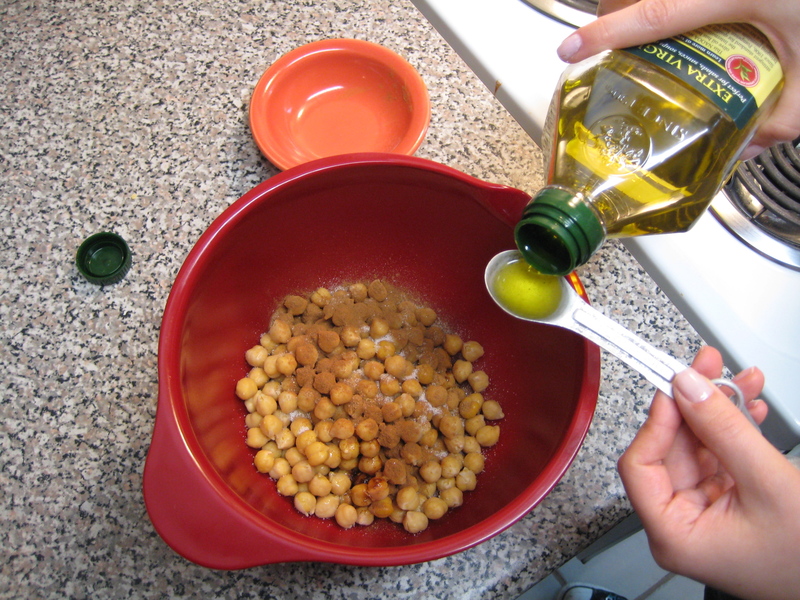 Next, in a small mixing bowl combine the chickpeas with the olive oil and all spices. Give it a good toss to evenly distribute. 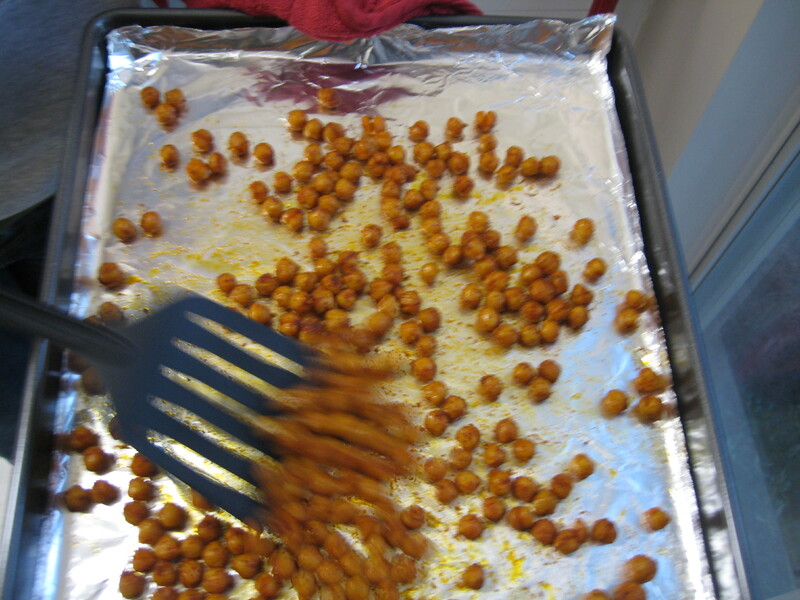 Next, pour the chickpeas onto the prepared baking sheet so that they are in a single layer and pop into the oven. These will take 40 minutes in the oven before reaching optimal crunchiness. Every 10 minutes take the tray out and toss with a spatula. Do not shake the pan to rotate the peas when they are hot, as this might cause them to pop/explode in one’s face. You’ve been warned. To make the sweet version of these crunchy peas follow the directions above EXCEPT only toss the dried chickpeas in olive oil, cinnamon, sugar, and any additional spices you have selected. 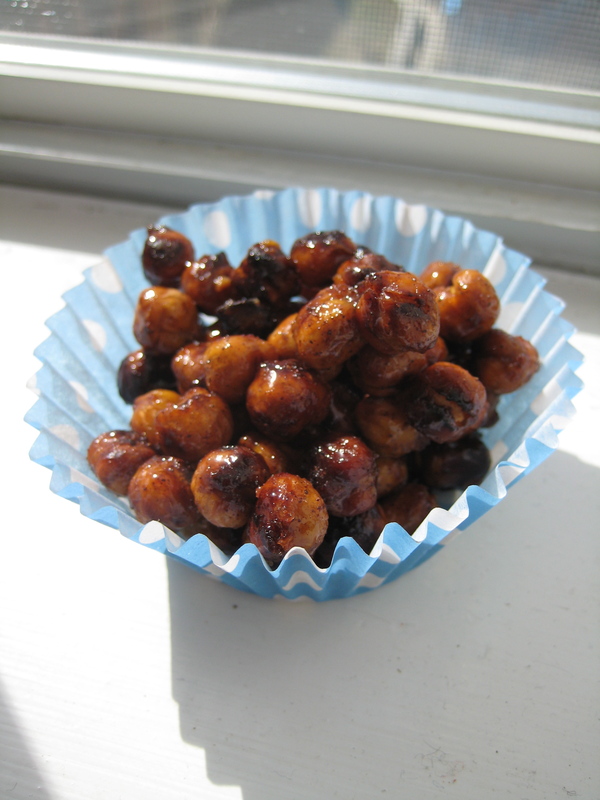 Immediately after taking them out of the oven, pour the chickpeas into a small mixing bowl and toss them with the honey while still piping hot. Pour them back onto the baking sheet and allow them to cool and the honey to harden. Also, since these have sugar on them they need to be monitored more closely in the oven to prevent burning. Bake for only 30-35 minutes. If you enjoyed this post be sure to subscribe to Reckless in the Kitchen and never miss a delicious post! 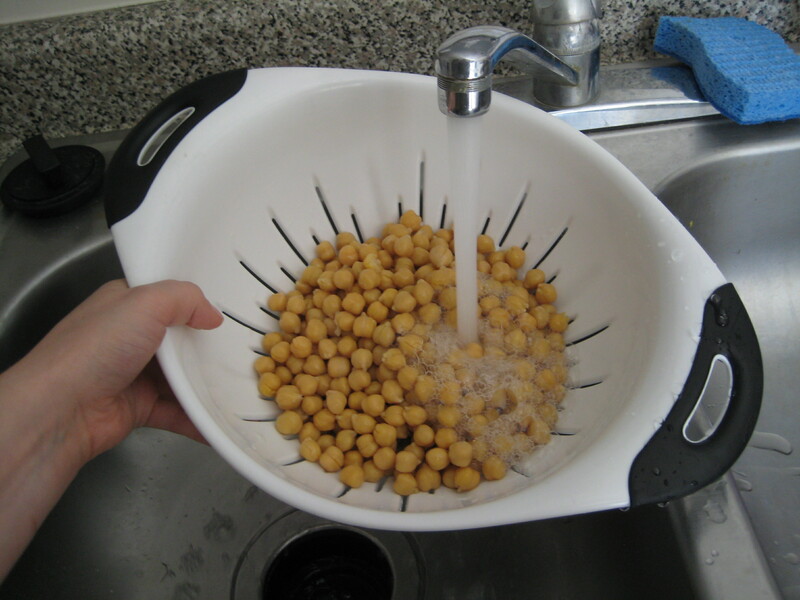 First drain the chickpeas in a strainer. Wash with cool water to rinse the starch off. These will take 40 minutes in the oven before reaching optimal crunchiness. Every 10 minutes take the tray out and toss with a spatula. 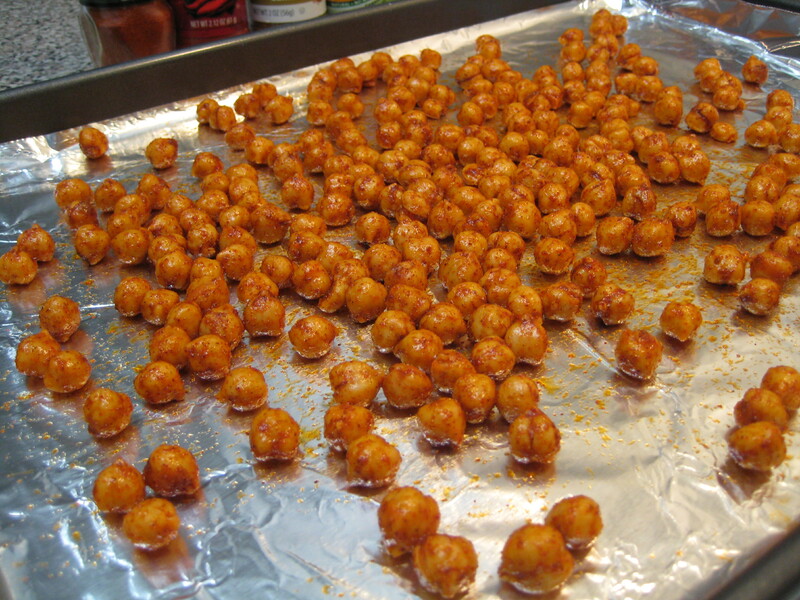 These will take 30-35 minutes in the oven before reaching optimal crunchiness. Every 10 minutes take the tray out and toss with a spatula.